With an unexpected and rare night of leisure just before the busy summer kicked in, we decided to spend our bit of freedom at the ball park. We were lamenting the retirement of Derek Jeter from the Yankees and thought a baseball game sounded like a fun night out. So, off we went to Legion Stadium to watch the Wilmington Sharks play. This turned out to be an enjoyable way to spend the evening. The stadium is larger than expected with the capacity to seat 6,000 people. The sports complex is home not only to the Wilmington Sharks, but the Wilmington Hammerheads soccer team and the Wilmington Tigers football team. Foodies that we are, we did note that while there are concessions available, there is not much to be said about the food. We were happy to find; however, that there is craft beer on draft! Of course, this brought us to the topic of the best stadium food! So with the post season approaching, we thought we would find out exactly which stadiums in the American and National league are serving up more than team spirit with a hot dog and a side of fries. So, here are a few fun foodie finds! Best fish sandwich in baseball? If you have a taste for a wild Pacific salmon sandwich the only place to go is Ivar’s at Safeco Field in Seattle. Enjoy a fresh Dungeness Crab sandwich on garlic sour dough bread at Crazy Crabz’s while you watch the San Francisco Giants play at AT&T Field. Vegetarians will be happy to find that they can grab a bite at the ball park too! The Poppie, served at Planet Hoagie in Citizens Park in Philly is a sandwich made of roasted eggplant, fresh mozzarella, sundried tomatoes and red peppers. Bacon on a stick? Yup! It is 3/4 inch thick, Hungarian smoked and dipped in maple syrup. Rangers fans are gobbling them up at Globe Life Park in Texas. The most inventive “dish” we found is actually a drink with the food as a garnish. 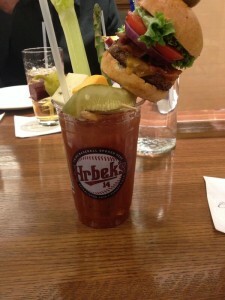 Twins fans are imbibing on “The Best Bloody Mary Ever” served at Hrbek’s Pub inside Target Field in Minnesota topped with a full bacon cheeseburger! With any luck, Wilmington will hop on the bandwagon and mix it up with some new Southern style cuisine at Legion Stadium sometime soon. Until then however, grab a bite before hand then go and enjoy the game! This entry was posted in Beacon house inn, Carolina Beach, Craft Beer, Dining, Family Friendly, General, parks by admin. Bookmark the permalink.